Innovative research and case studies will address themes of ecological conservation, urban sustainability, climate change, health, governance, technological innovation and more. Are you interested in knowing more about community-engaged water research in BC? 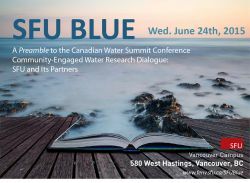 As a preamble to the Canadian Water Summit, join us at SFU BLUE – a dialogue of community-engaged water research, profiling work emerging between the university and its partner organizations. Innovative research and case studies will support conversations on the themes of ecological conservation, urban sustainability, climate change, socio-economic factors, health, governance, stakeholder management and technological change. To encourage dialogue, SFU researchers will provide short 10 - 15 minute overviews that profile different aspects of the topic, leaving time for partners and other panellists to highlight their priorities and engage the audience.